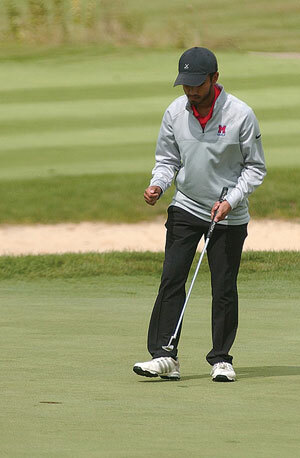 Marysville’s Sameer Parashar reacts after sinking a putt on No. 5 at Darby Creek on Wednesday. The Monarchs competed in the final Ohio Capital Conference match of the season. Marysville’s boys golf squad placed fourth during the final Ohio Capital Conference match of the season on Wednesday. Upper Arlington won the event that was held at Darby Creek. The Golden Bears shot a 312. Hilliard Davidson was second at 315, followed by Dublin Coffman-318, MHS-331, Central Crossing-395 and Westland-500. Gavin Cossette (76) and Sameer Parashar (77) both shot career low scores for the Monarchs. Chris Borjas posted an 85, followed by Justin DeHoff-93 and Caden Fulkerson-93. Fairbanks’ girls scored a 218-244 victory over Mechanicsburg during a dual match. Allison Kise of FHS was the medalist with a 52. She was followed by Veronique Grand-53, Mary Weisburn-56, Shelby Jones-57, Gabby Vamos-60, Kaylee Mitton-63 and Shelby Burns-80. The Lady Panthers wrapped up the regular season with a 7-0 record. The Fairbanks boys defeated West Jefferson and West Liberty at Darby Creek. FHS, which is 14-0 in the Ohio Heritage Conference, carded a 159, followed by West Jeff-204 and West Liberty-208. Travis Brake of FHS was medalist with a 37. He was followed by Seth Payne-39, Alex Crowe-39, Justin Brackenridge-44, Aidan Wilson-44 and Logan Bocsy-45. Marysville’s girls placed fourth during an OCC match. New Albany won the event that was played at Westchester Golf Club with a score of 289. Upper Arlington carded a 304, followed by Dublin Coffman-316, Hilliard Davidson-368, Canal Winchester-374 and Marysville-377. Olivia Virts led MHS with a 92. Maddie Powers, Olivia Ishmael and Cassi Van Dyke each carded a 95. The Lady Cats on North Union missed out on a Central Buckeye Conference win by a single stroke. The Lady Cats made the trip to Cherokee Hills Golf Course to square off against Indian Lake and lost, 234-235. NU’s Katlyn Saunders was the medalist of the match with the best score of 54. Kendra Nicole stroked a 55. Maddy Snyder turned in a 60 on the scorecard. Grace Swank tallied a 66 and Lilly Taylor finished with an 80. The Lady Cats now have a 1-6 record in the CBC and will return to action today at Mill Creek Golf Course to take on Urbana. The Bunsold girls golfers won their third dual match of the season, beating Bexley by a 181-197 verdict. Emily Williams of Bunsold was medalist with a 38, including a birdie on hole 9. Avery Prohaska shot a 42, followed by Reese Cordonnier-47 and Grace Pancallo-54. Those were all low scores for the season.